We recently reviewed the Feelwell's Probiotic range of treats, which all the dogs loved. 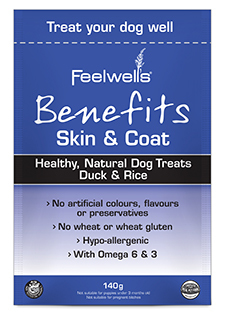 The Benefits range of healthy, natural dog treats are made with Duck & Rice and instead of being life stage probiotic products, they are targeted at specific areas of your dogs health. 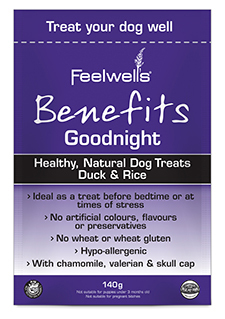 The treats in this range are - Joint & Mobility, Skin & Coat, Breath & Dental and Goodnight. These treats all proved to be very tasty - Bandit and Skipper were crazy about them! It's great to find some healthy treats that the dogs enjoy, as they can often be a bit bland and boring. All four varieties of the treats are healthy, natural, hypoallergenic and contain no artificial colours, flavours or preservatives. They are also free from the following ingredients which can often be triggers for allergies - wheat, gluten, beef, egg, dairy, pork and soya. Perfect for dogs like Henry and Skipper who are sensitive to alot of foods. Joint & Mobility - As the name suggests, these treats help promote joint health and mobility and are ideal for older dogs. 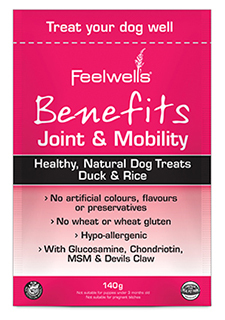 They contain glucosamine, chondroitin, MSM & Devils Claw which help with creaky, stiff joints. Devils Claw is also a natural anti-inflammatory. Skin & Coat - After trying these treats for a few weeks we noticed a great improvement in Skipper and Bandit's skin condition, with Bandit in particular seeming less itchy. They contain Omega 6 and 3 for healthy skin and a shiny, glossy coat. Breath & Dental - There is nothing worse than smelly dog breath, but these yummy treats could make your dog's breath smell a little sweeter. Tooth decay is also a big problem in adult dogs. Feeding these alongside a good tooth cleaning regime cold help prevent problems later in your dog's life. They contain peppermint, parsley, green tea and cranberry. Peppermint & parsley freshen breath and green tea and cranberry are powerful anti-oxidants which help to kill bacteria. Goodnight - ideal as a treat before bedtime or at times of stress, I think these are a brilliant idea. They contain chamomile, valerian & skullcap which are all known for their relaxing and calming properties. These would be brilliant to feed to dogs who don't settle very in the nights, or perhaps to help a newly rescued dog settle in. I will defiantly be feeding these to the dogs during the stressful November 'firework season'. Thanks for sharing your blog,Dog grooming is essential not only on pet’s physical health but also his physiological and psychological well being.